Earlier this week, I was working on a specific project and encountered a specific error while working with some service calls over the wire. I ended up discussing with few people about whether or not I should return a specific StatusCode type for the situation I was dealing with. About 5 minutes after we started talking, I thought about how come I never blogged about the different status codes you may have. Something pretty “simple” and “frequent” if you code on the web. HttpStatusCode contains the values of status codes defined for HTTP. This enumeration element is contained inside System.Net. The System.Net namespace provides a simple programming interface for many of the protocols used on networks today. 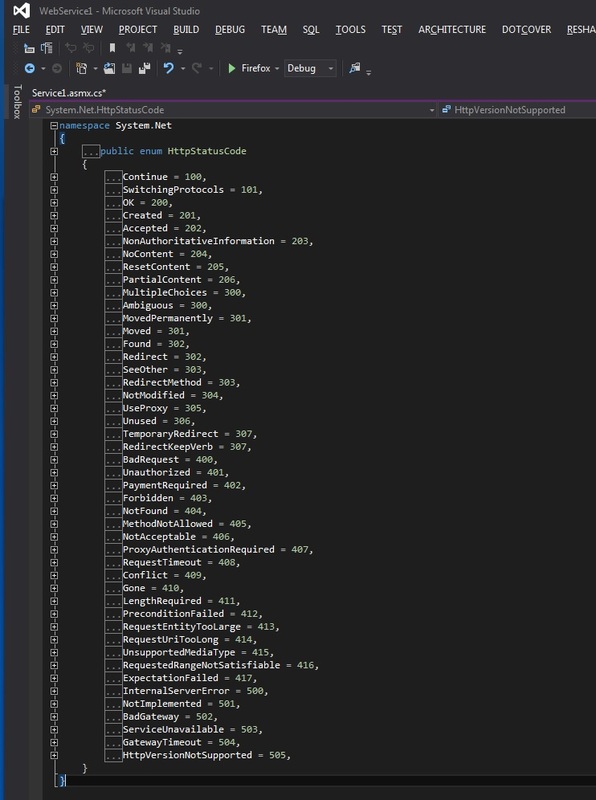 The following picture is a screenshot of my Visual Studio 2012 UI while inspecting the HttpStatusCode enumeration. For the matter of our project discussion, I ended up choosing the proper status code for the situation I was dealing with, but it was worth revisiting this concept. The following is a detailed description of each status code. HttpStatusCode.OK indicates that the request succeeded and that the requested information is in the response. This is the most common status code to receive. HttpStatusCode.Created indicates that the request resulted in a new resource created before the response was sent. HttpStatusCode.NonAuthoritativeInformation indicates that the returned metainformation is from a cached copy instead of the origin server and therefore may be incorrect. HttpStatusCode.NoContent indicates that the request has been successfully processed and that the response is intentionally blank. HttpStatusCode.ResetContent indicates that the client should reset (not reload) the current resource. HttpStatusCode.PartialContent indicates that the response is a partial response as requested by a GET request that includes a byte range. HttpStatusCode.MultipleChoices indicates that the requested information has multiple representations. The default action is to treat this status as a redirect and follow the contents of the Location header associated with this response. HttpStatusCode.Ambiguous indicates that the requested information has multiple representations. The default action is to treat this status as a redirect and follow the contents of the Location header associated with this response. HttpStatusCode.Moved indicates that the requested information has been moved to the URI specified in the Location header. The default action when this status is received is to follow the Location header associated with the response. When the original request method was POST, the redirected request will use the GET method. HttpStatusCode.Found indicates that the requested information is located at the URI specified in the Location header. The default action when this status is received is to follow the Location header associated with the response. When the original request method was POST, the redirected request will use the GET method. HttpStatusCode.Redirect indicates that the requested information is located at the URI specified in the Location header. The default action when this status is received is to follow the Location header associated with the response. When the original request method was POST, the redirected request will use the GET method. HttpStatusCode.SeeOther automatically redirects the client to the URI specified in the Location header as the result of a POST. The request to the resource specified by the Location header will be made with a GET. HttpStatusCode.RedirectMethod automatically redirects the client to the URI specified in the Location header as the result of a POST. The request to the resource specified by the Location header will be made with a GET. HttpStatusCode.NotModified indicates that the client’s cached copy is up to date. The contents of the resource are not transferred. HttpStatusCode.UseProxy indicates that the request should use the proxy server at the URI specified in the Location header. HttpStatusCode.Unused is a proposed extension to the HTTP/1.1 specification that is not fully specified. HttpStatusCode.TemporaryRedirect indicates that the request information is located at the URI specified in the Location header. The default action when this status is received is to follow the Location header associated with the response. When the original request method was POST, the redirected request will also use the POST method. HttpStatusCode.RedirectKeepVerb indicates that the request information is located at the URI specified in the Location header. The default action when this status is received is to follow the Location header associated with the response. When the original request method was POST, the redirected request will also use the POST method. HttpStatusCode.BadRequest indicates that the request could not be understood by the server. System.Net.HttpStatusCode.BadRequest is sent when no other error is applicable, or if the exact error is unknown or does not have its own error code. HttpStatusCode.Unauthorized indicates that the requested resource requires authentication. The WWW-Authenticate header contains the details of how to perform the authentication. HttpStatusCode.PaymentRequired is reserved for future use. HttpStatusCode.Forbidden indicates that the server refuses to fulfill the request. HttpStatusCode.NotFound indicates that the requested resource does not exist on the server. HttpStatusCode.MethodNotAllowed indicates that the request method (POST or GET) is not allowed on the requested resource. HttpStatusCode.NotAcceptable indicates that the client has indicated with Accept headers that it will not accept any of the available representations of the resource. HttpStatusCode.ProxyAuthenticationRequired indicates that the requested proxy requires authentication. The Proxy-authenticate header contains the details of how to perform the authentication. HttpStatusCode.RequestTimeout indicates that the client did not send a request within the time the server was expecting the request. HttpStatusCode.Conflict indicates that the request could not be carried out because of a conflict on the server. HttpStatusCode.Gone indicates that the requested resource is no longer available. HttpStatusCode.LengthRequired indicates that the required Content-length header is missing. HttpStatusCode.PreconditionFailed indicates that a condition set for this request failed, and the request cannot be carried out. Conditions are set with conditional request headers like If-Match, If-None-Match, or If-Unmodified-Since. HttpStatusCode.RequestEntityTooLarge indicates that the request is too large for the server to process. HttpStatusCode.RequestUriTooLong indicates that the URI is too long..
HttpStatusCode.UnsupportedMediaType indicates that the request is an unsupported type. HttpStatusCode.RequestedRangeNotSatisfiable indicates that the range of data requested from the resource cannot be returned, either because the beginning of the range is before the beginning of the resource, or the end of the range is after the end of the resource. HttpStatusCode.ExpectationFailed indicates that an expectation given in an Expect header could not be met by the server. HttpStatusCode.InternalServerError indicates that a generic error has occurred on the server. HttpStatusCode.NotImplemented indicates that the server does not support the requested function. HttpStatusCode.BadGateway indicates that an intermediate proxy server received a bad response from another proxy or the origin server. HttpStatusCode.ServiceUnavailable indicates that the server is temporarily unavailable, usually due to high load or maintenance. HttpStatusCode.GatewayTimeout indicates that an intermediate proxy server timed out while waiting for a response from another proxy or the origin server. Check here for some online documentation about HttpStatusCode.